(April 2019) This week is the 5th Anniversary that Chef Ermes and his wife Teresa became owners of Montecatini Ristorante. 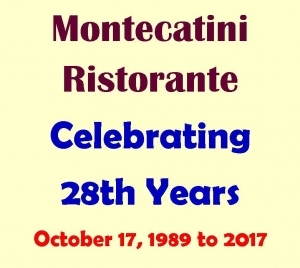 As many of our customers know, Chef Ermes Paulin opened Montecatini on October 17, 1989 working as Chef-employee. His meticulously prepared Italian cuisine is the foundation of success for Montecatini. On April 1, 2014, when Chef Ermes became Chef-owner of Montecatini, his wife Teresa became General Manager. Within the last 5 years, many changes and improvements came to our restaurant. We installed sound-absorbing panels all around the dining area. Our lighting, décor, furniture and fixtures have been updated at our front entrance, bar and bathrooms. We did away with the servers manually writing down orders and adding up checks with a calculator, and installed a Wi-Fi Point-of-Sale system using Ipads and kitchen printers. We replaced our outside awning and inside carpets, and installed energy-efficient new windows and a cherry wood front door. We have an E-Club, a new website and use social media such as Facebook to keep in touch with our customers. 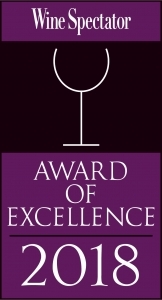 We added Happy Hour and improved our wine list which earned us Wine Spectator Magazine’s Award of Excellence. We improved our service reminding ourselves that we shall treat all our customers like kings and queensno matter how they are dressed or what wine they ordered. Throughout all these, one thing remains constant at Montecatini, our talented and hardworking Chef Ermes’ consistently delicious cuisine. That’s because for the past 30 years, he is at the restaurant almost every day starting at 9 am, planning, preparing, cooking and sharing his love of Italian cuisine with everyone. Please join us and celebrate Chef Ermes and Teresa’s five years of Montecatini ownership! 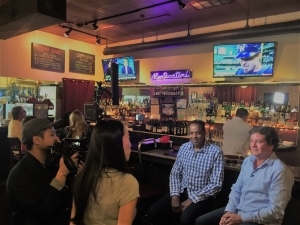 (February 2019) “This is San Francisco” chose Montecatini to be featured in their TV show and came to film us at the end of last year. They interviewed our Chef-owner Ermes Paulin and his wife, General Manager Teresa. They stayed during our dinner service and interviewed several of our dinner guests also. Our segment in “This is SF” was aired on CBS Channel 5 on February 16th at 7:30 pm and again on Sunday February 24th at 1:30 pm on KBCW – Channel 44. 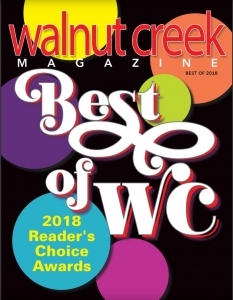 (December 2018) Page 43 of Walnut Creek Magazine’s Best of 2018 Issue Highlighted Montecatini Ristorante as the Best Italian Restaurant. (August 31, 2018 Issue) Wine Spectator Magazine honors Montecatini Ristorante for having an outstanding restaurant wine list. Wine Spectator’s Restaurant Awards recognize restaurants from all 50 states and more than 75 countries whose wine lists offer interesting selections, are appropriate to their cuisine and appeal to a wide range of diners and wine lovers. Montecatini is so pleased to received this honor. Whether our customers want to be modest or spurge for a special evening, we have beautiful wines to meet everyone’s wishes, and our wait staff treats everyone like royalty regardless of the wines they ordered. Along with our wine list, we also feature a wine-by-the-glass list with about 25 wines, of which nearly 15 wines are available at Happy Hour prices from 5:00 to 6:30 pm every day. Our current wine-by-the-glass list offers sumptuous Italian Reds and Whites starting at $5 per glass to the big and beautiful reds such as Caymus Cabernet at $27, and $19/glass during Happy Hour. (June 2018) We are so grateful to customers like you, who voted for Montecatini for having the Best Italian Food in the San Francisco East Bay three years in a row. 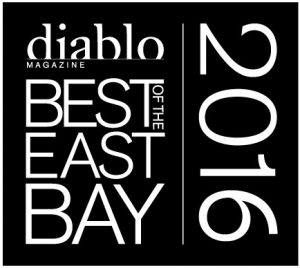 We were also Diablo Magazine’s Best of East Bay in 2002, 2007, 2016, and 2017 for Best Italian Food. Hardworking, talented and humble, our Chef Ermes Paulin, has lead the Montecatini team to create amazing pastas, sauces & dinners that have delighted at least two generations of East Bay residents and worldwide visitors. This year, our Chef Owner, Ermes Paulin is also being recognized as the Best Chef of the San Francisco East Bay area. Under his leadership since October 17, 1989, our restaurant has become a stable of amazingly delicious Italian food in Walnut Creek and our community beyond. His winning formula for Montecatini is fresh ingredients, meticulous preparation, large portions, reasonable prices and great service. Like the past three decades, Chef Ermes still wakes up and be at the restaurant at 9 am almost every day to apply his magic in the kitchen of Montecatini Ristorante. Borne in Vicenza, Italy, Chef Ermes was classically trained in Rome at the age of 17 for two intensive years at one of the most prestigious culinary academy of the time. After graduation, Chef Ermes had worked in Rome, London, Ramsar, the cruise ship Fairsea, San Diego and now in the San Francisco Bay Area. He had cooked for heads of states of the past, such as the last king of Italy Umberto II and Ronald Reagan, and sport celebrities of the present, such as baseball’s Tony La Russa and basketball’s Klay Thompson at Montecatini Ristorante. We are tremendously appreciative of Montecatini’s entire team, from the front of the house hosts, servers, bartenders, bussers, to every person of the kitchen staff. Everyone contributes in his or her unique way to make Montecatini the award-winning restaurant we have today. Your recognition inspires us to work hard to maintain our high standard for every dish we present, to every customer we serve. THANK YOU!!! 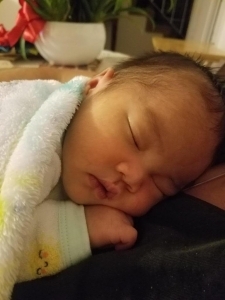 Our Sharon Delivered a Baby Boy! (June 2018) Congrats and Best Wishes to our server and hostess Sharon Parker! She brought a 8 lb 2 oz, 29 inches bundle of joy baby boy into the world on June 14, 2018! We are all so happy for her and will miss her during her maternity leave. (February 2018) Diablo Magazine is currently (Feb 2018 Issue) highlighting Montecatini’s Pollo Alla Schiacciata and Lasagna Casalinga as “Showstoppers” within the SF East Bay food scene. “Crispy”, “Juicy” and “Unique”! Indeed those two dishes are among our customers’ favorites!!! Chef Ermes prepares our Schiacciata (Brick-pressed) from fresh 1/2 chicken (never pre-cooked) with fresh rosemary each time; served piping hot from the oven, it is amazingly juicy and sumptuous… but you must be patient, it takes 25-30 minutes to prepare. 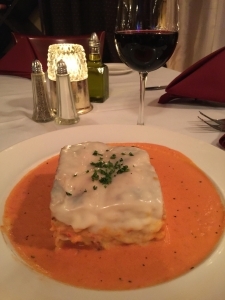 Our Lasagna Casalinga is truly Italian comfort food, with our unique signature tomato cream sauce, which also takes 25 minutes to prepare. They are well-worth the wait! Celebrate our 28th Anniversary Today! (October 17, 2017) Free Prosecco (Italian Champagne) for all our guests joining us for dinner tonight! It was 28 years ago that the Loma Prieta Earthquake hit the San Francisco Bay Area, several minutes after Chef Ermes opened the doors to Montecatini Ristorante for the 1st time! Chef Ermes is now our Chef-owner and he is still here almost everyday, creating the most delicious cuisine for all our guests. Please join us for dinner. (July 2017) Wine Spectator Magazine honors Montecatini Ristorante “for having one of the most outstanding restaurant wine lists in the world.” We are delighted and humbled for receiving this Award of Excellence from Wine Spectator, being in the company of some of the finest restaurants around the world. Please visit https://restaurants.winespectator.com/restaurant/3919/montecatini-ristorante or read page 94 of Wine Spectator’s August 31, 2017 issue. Our philosophy at Montecatini is to provide authentic Italian cuisine, amazing service, and superb wines and cocktails that would bring joy to everyone, whether for a family on a budget or a foodie on a first date. Our wine list highlights Italian and Californian wines, being an Italian restaurant that is located within 2-hour driving distance of the world famous Napa and Sonoma Valleys. We carry Orin Swift’s Machete on our wine list long before it was name #6 on Wine Spectator’s list of 2016 Top 100 wines in the world. We change our wine-by-the-glass list regularly but always have several delightful Italian wines starting at $5-7. We want to make expensive wines accessible and comfortable for our guests. For example, we have Frank Family Zinfandel for $10 and Far Niente Chardonnay for $15 during Happy Hour. 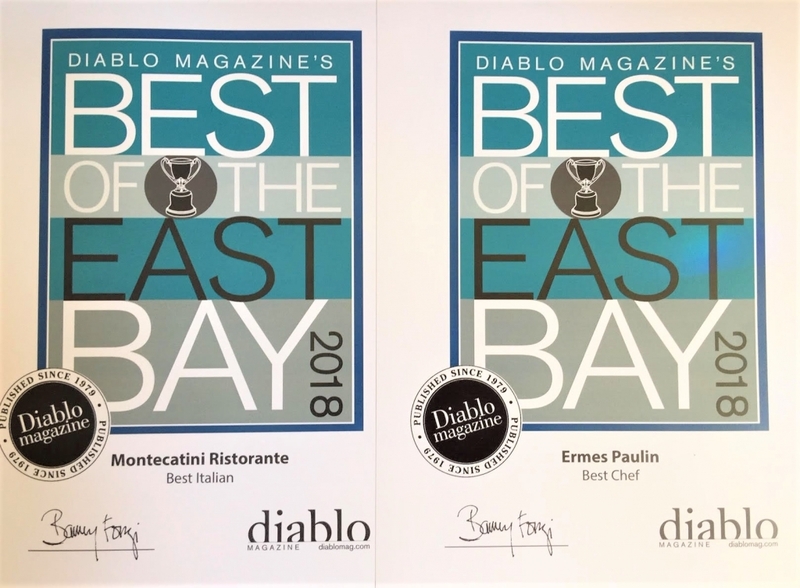 (July 2017) Thank you, Montecatini customers and Diablo Magazine readers, who just voted Montecatini the Best Italian Restaurant in the San Francisco East Bay Area in 2017 (http://trendmag2.trendoffset.com/publication/?i=418838&p=52), like you did last year in 2016, and also in 2007, and 2002! Our Executive Chef and Owner, Ermes Paulin, is the heart and soul of our restaurant, who opened Montecatini on the day of the Loma Prieta Earthquake on October 17, 1989! He is still here at the restaurant every day, creating the most delicious cuisine from his native Italy! 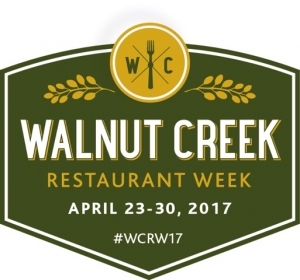 (April 22, 2017) Check out this TV coverage on Montecatini Ristorante where Yelp’s Community Manager, Stephanie Yolich stopped by the KRON4 studios to tell Anchor Will Tran about Walnut Creek Restaurant Week 2017. She featured four Walnut Creek restaurants where Montecatini is one of the 4 restaurants Yelp reviewers highly recommended. Please watch this video. (April 1, 2017) Join us for dinner from Sunday April 23 through Sunday April 30, and enjoy a three-course dinner for $30. You will have the choice of our Minestrone Toscano Soup or Salad, choice of entrees including Capellini Prawns, Pork Cutlet Sorrento or our famous Seppia Dore, and also dessert of Tiramisu Montecatini or Cheesecake Del Giorno. Please click here to see our Restaurant Week 2017 menu. 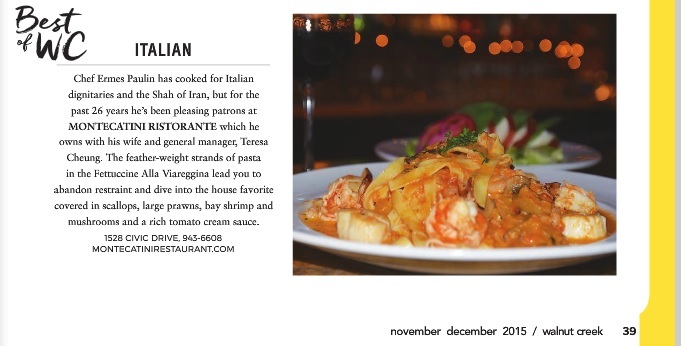 (December 2016) The December 2016 issue of Walnut Creek magazine revealed the Best of Walnut Creek in 2016… Montecatini’s signature dish Fettuccine Alla Viareggina has been voted to be the BEST PASTA IN WALNUT CREEK! We are grateful for this honor and appreciative for this special gift from Santa and our Walnut Creek community! We promised to continue to put a little love in every dish we made, just like we have been since 1989. (October 2016) After so many years, Chef Ermes, Raul Lopez, and David Lopez are still working at Montecatini almost everyday, like 27 years ago. Pass by our kitchen and congratulate them on bringing joy to so many people over the years. Although Montecatini only serves dinners, you can find Chef Ermes in the kitchen almost everyday starting around 10 am planning and prepping for that evening’s cuisine. Knock on the window to say Hi and he loves it if you speak Italian to him! (July 2016) Montecatini Ristorante has been awarded the “Best of the East Bay 2016″ for Best Italian restaurant! San Francisco East Bay Area’s Diablo Magazine had make this announcement. 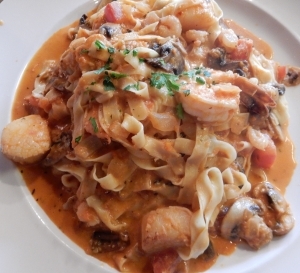 Diablo readers chose Montecatini Ristorante the Best Italian Restaurant in the East Bay! Thank you for this honored recognition! 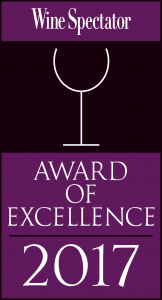 We promise to live up to this award by providing our customers with amazingly delicious Italian cuisine and impeccable service at all times. 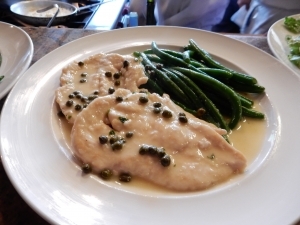 Montecatini makes the Best Chicken Piccata in the San Francisco East Bay!!! (August 2016) Diablo Magazine’s August 2016 Issue just published their foodie staff’s “100 Best Bites” of San Francisco East Bay. Page 30 (#36) of the magazine describes Chef Ermes’ Pollo Alla Piccata, “In this Italian classic, juicy chicken breast rests in a lemon-drizzled white wine sauce, and is served with pasta and steamed vegetables.” Simply sumptuous! 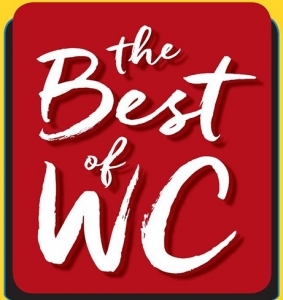 (November 2015) Montecatini has been recognized as the “Best Italian” restaurant of Walnut Creek by the readers of Walnut Creek Magazine. See Page 39 of the November/December 2015 Issue of Walnut Creek Magazine to read about us. We give thanks to customers like you! who give us inspiration to do our best every day, to have fun and share a delicious life! 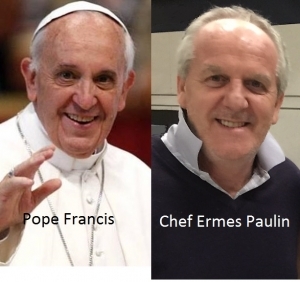 (September 2015) Some of our customers told us that our Chef Ermes Paulin looks like Pope Francis? What do you think? We know they have a few things in common: Both speak Italian, have the Roman nose, like Fiat, and they are hardworking and humble men that bring a little bit of heaven into our lives. (June 2015) Read San Francisco East Bay Area 86 Magazine featured article about us in their July 2015 Issue Click here. 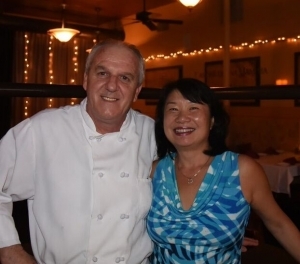 (April 1, 2014) Chef Ermes Paulin and his wife Teresa Cheung became owners of Montecatini Ristorante! Read our story here and take our Quiz to learn more about Chef Ermes, Teresa and Montecatini Ristorante. (2007) Montecatini, lead by Chef Ermes, is recognized again for being the Best Italian Restaurant in the San Francisco East Bay Area with Diablo Magazine’s Best of East Bay 2007 Award. (2002) Chef Ermes Paulin lead the Montecatini team and received Diablo Magazine’s Best of East Bay 2002 Award for Best Italian Restaurant. (~1995) Owner Ray Johnson sold Montecatini Ristorante to Kip Finn. (1989) Montecatini Ristorante opened by owner Ray Johnson and Chef Ermes Paulin on October 17, 1989, several minutes before the 7.1 Loma Prieta Earthquake that ended Game 3 of the Oakland A’s vs SF Giants World Series. There were 26 customers that evening! Ray named the restaurant after the little town in Tuscany Italy where his grandmother came from, Montecatini.